What you post on-line matters, and it is available to viewers potentially forever! TLC for Kids wants to review some common mistakes that get you rejected for any job, not just a childcare job. First, in today’s technologically advance world employers are able to “check you out” even before they hear your voice. So sometimes a potential employer’s first impression of you could come from that picture of you doing a keg stand that you posted three years ago. You know the old saying “a picture is worth a thousand words”? Well, it is true. Whatever you do make all of your social media accounts TOTALLY private or better yet don’t post anything that wouldn’t make your grandmother proud. Here are a few other things that could be potentially damaging besides your pictures. 1) Complaining about your boss and/or your job is a big no-no. This is unprofessional and shows a lack of loyalty. 2) Using foul language is not only offensive to some but also shows a lack of maturity. 3) Sexual oversharing is offensive to some and also shows a lack of maturity. 4) What and who you choose to “like” or “follow” tells a little secret about you. 5) Making discriminatory or hateful comments related to race, gender, religion, politics, etc. It is also beneficial to look at the email address, username and passwords that you use. While hotmamma@aol.com might be cute to use with your friends, it is completely inappropriate to use in a professional capacity. At some point, your application will be reviewed by someone who has access to your password. Once again, keep it clean! Lastly, your voicemail message is very important. Make it short, sweet and professional. No soap box speech or “Promiscuous Girl” lyrics on your outgoing voicemail message. Keep these tips in mind when applying for a job, especially a childcare job with TLC for Kids. College Students Make Extra Money! B eing a full-time student can be taxing – physically, emotionally, and certainly financially. But what if there was something you could add to your schedule that could actually relieve some of that stress? Surprise – there is! Find babysitting jobs through TLC for Kids and you’ll not only make good money to help support yourself through school, you’ll also have fun! Be a family assistant in the home. This can range from driving kids to after-school activities, running family errands, prepping meals, and arranging calendars, to playing with one child while a parent takes care of the other. Together, you and the family can make the position work. Tutor or help children with their homework. If you have your Bachelor’s Degree you can use knowledge from your earlier school years, or even share information from your current studies to be a TLC tutor. This is very rewarding work for students working on their masters, and both kids and parents will be so appreciative. Of course, you can also combine any or all of these skills and take on a traditional babysitting role! You can work regularly after school hours, only on the weekends, or any other combination of times. TLC can help you find jobs around your schedule. Between local families and families visiting hotels you can make your college spending money picking up babysitting jobs around your schedule. These are just a few ways that you can work with us to make extra money while you’re in school! We’re excited to help you find a good fit for your abilities and your time. Apply now at tlcforkids.com. Do you have a passion for working with children? Are you reliable? Are you looking for a flexible job with good hours and competitive pay? TLC for Kids offers many types of nanny positions (permanent, part-time, full-time, after-school, etc. ), but we also offer temporary babysitting positions. Our temporary jobs are great for students. As a TLC temporary nanny, you have complete control over your own schedule—there is an online calendar where you write the hours you are available. The calendar lets the agency know when you are available, so when a family calls and requests a sitter from6pm-10pm on Thursday night, they know they can call you to take the job. This type of scheduling allows you to go to school, maintain your social life, volunteer, etc. Another perk of being a TLC sitter is the pay: a minimum of $12/hour (most of the families also tip their sitters). Plus, you always get paid for four hours of work, even if you only work for three. For example, if a family only needs a caregiver from 3pm-6pm, they are required to pay their sitter for four hours worth of work. You can also earn more money by taking multiple jobs a day. If you work for one family from 7:30-4:30, it is easy to get another job that goes from 5:30-10:30. The more you work for TLC for Kids, the more families start to request you and the more your income grows. Not only is being a temporary babysitter profitable and flexible, but it is also a lot of fun! TLC for Kids caregivers are expected to show up to a job with a blue TLC for Kids bag packed with fun, age-appropriate activities for the kids. Most of the children know that TLC sitters bring cool games to their house, so when you arrive on the job the kids are very excited to play with you. To become a TLC temporary sitter, you must be 18 years or older and have a minimum of three childcare references and an insured vehicle. 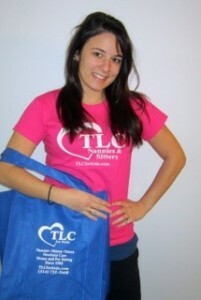 Apply online today to become a TLC babysitter! Another month for our “Three minute Q and A with TLC nannies.” Each month we are bringing you some great Q and A with our nannies so they can share some info and insight about the nanny profession and educate others on some of the fun aspects of the job. This month we interviewed Kayce. 1) Why did you decide to become a nanny? I decided to nanny when I was in college working on my undergraduate degree. I decided on nannying because I love children and couldn’t imagine not working with children while I was in school. 2) What’s your favorite thing about being nanny? My favorite part about being a nanny is the fact that I still get to help children learn while having fun. The learning is not always academic. Sometimes it’s as simple as helping a little one figure out how to stack blocks without them falling over. 3) What fun activity are you looking forward to doing with your charge(s) this week? Since it has been raining we were staying inside. We went to sky zone to bounce and have fun while it is rainy and nasty out. Most weeks we love hanging out at the pool and we are excited for our six flags trip at the end of the month. 4) Where do you get your ideas for creative activities? What’s your favorite craft? Lost of ideas come from Pinterest but mostly we love just hanging out. Coloring is always a fun activity. The girls are working right now on painting a custom made doll house the way they want it. 5) Do you follow any blogs, websites to share with other nannies? Nothing on a regular basis. I check out stuff through Pinterest and Facebook mostly. And during group jobs I get lots of ideas from other TlC nannies. What makes certain TLC for Kids sitters get requested more than others? Obviously, you have to get your foot in the door by working for a couple of families before any of them will request you specifically the next time they call. What is it that makes a family remember a great babysitter and ask for you by name? THE KIDS LOVE YOU. Kids who are old enough to speak will ask for you by name. I literally can hear kids screaming in the background when a couple of clients call. The mom will ask, “who do you want?” and the kids will yell the names of their favorite babysitters. Mom and Dad will surely be more comfortable about leaving if they see a toddler take your hand to show you their favorite toys. It is very important to break the ice with the kids when you arrive, and keep up the fun while the parents are gone! THE HOUSE IS PICKED UP WHEN THEY GET HOME. It isn’t always possible, due to time constraints, but do try to put in the extra effort. Parents love coming home to a tidy kitchen at the end of an evening out. We’re talking about 10 minutes to load the dishwasher, wipe down counters, and clean up the mac & cheese pot! I had one mom say lately that she loves a certain sitter, and her kids love her too, but it’s just not worth it because her house is a disaster when she comes home. This is one of the things that sets TLC sitters apart from the teenager down the street. THEY BRING A FUN ACTIVITY PICKED OUT SPECIALLY FOR THE KIDS. This is one of the biggest things that wins over parents. You don’t have to spend a lot of money, but parents love it when you keep in mind the interests of a child and bring an art project, a special library book, or even a holiday craft or baking project in your TLC for Kids tote bag. Just be sure to OK things like this when you call to confirm, and clean up extra carefully as well! Empty-handed caregivers are NOT popular and usually get the day or evening off to a poor start. YOU SOUND FUN AND “TOGETHER” ON THE PHONE. Remember, your initial phone call is your first chance to make a great impression! Call ON TIME (the evening you receive the job), call from a quiet area and at a time when you can concentrate 100% on the conversation. Be upbeat and perky. Take careful notes and let the parent know you look forward to meeting their kids. I have actually had parents ask for a sitter to be replaced because she sounded “dead” on the phone! Also be prepared to answer questions about yourself and your background. LEAVE A WHAT WE DID WHILE YOU WERE GONE SHEET. Make sure it lists all of the fun things you did! Keep careful notes if caring for an infant (feedings and diaper changes) or a sick child (food, drinks, medicine, mood, activity, and temperature.) Write a note saying you would love to come back to their house because you had a great time! Parents also love to hear funny things their kids said or did. Even better, they would love to see a cool art project that you helped with or a puzzle that you completed! Do you have any babysitting tips and tricks that you have found get you requested back? Please share! Are you a college student in St. Louis looking to make money without sacrificing the time it takes to go to (and focus on) school? TLC for Kids in St. Louis is looking to hire energetic, caring, and responsible caregivers to work as after school nannies for families in the greater St. Louis area. The hours of an after-school nanny are typically from 2pm-6pm or 3pm-6pm, Monday through Friday. This schedule allows you to go to your classes and still have a free evening to work on homework, or enjoy time with your friends. Plus, these positions pay anywhere from $12-$15 per hour. As an after school nanny, your job duties would include picking up the children from school, helping them with their homework, driving them to after-school activities/practices, doing light housework (dishes, laundry, picking up toys, etc. ), and in some cases making dinner. However, being an after school nanny is much more fulfilling that just going through the motions of an afternoon. For example, you are the first person the kids get to share their day with—they get to tell you about their happiest moments and their most disappointing ones. As you listen and comfort them, you get to build a bond with them that most people are not privileged enough to experience. This is also true when you are helping them with their homework or going to ballet classes with them. The kids trust you to guide them through the tough problems and be there to celebrate their accomplishments. Not many people have jobs that are as rewarding as that. Plus, if you are going into the field of education or any other area involving working with kids, this job is an excellent way to build your resume. Apply for a part time job online today at tlcforkids.com.